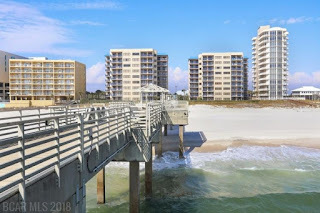 Orange Beach AL beachfront condo for sale at Four Seasons. Beautiful and exclusive 4BR/4BA condo located in sought after Four Seasons Condos. Only complex on the beach that has it's own private fishing pier. Catch pompano, redfish, bluefish from your back yard! Great rental history. Outside storage. Updated unit! Complex offers indoor pool, large outdoor pool and fitness center. Come see this one today before it's gone!